At the risk of embarrassing myself, here goes nothing. 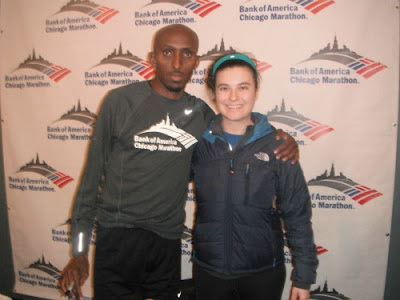 That's me above with 3-time Olympian, 4-time qualifier, Abdi Abdirahman. I'm bundled up, overdressing for the spring-like temperatures outside. I'm lucky that I put on some run-looking attire as I jetted out the door after an afternoon chained to my desk. And unlike the other 300 or so in attendance (or my estimate since the event was limited to that number), I didn't run because my leg still felt tight from Sunday's stair climb and I needed to gear up, or try, for tomorrow's scheduled run. But you don't really care about my story...hearing about Abdi is way cooler. Fresh off the Houston course where he qualified for his fourth Olympics, his first in the marathon distance (don't quote me on that just yet though I know his other three Olympic berths were in the 10,000m if nothing else), Abdi landed in Chicago to help launch the registration opening for the 35th annual Bank of America Chicago Marathon. He ran. He got a run for his money from the Sandburg cross-country team (I'm convinced they either chased him or sprinted so he'd have to run really fast). He signed autographs and posed for pictures (not sure how there wasn't a line stretching through the event space but I barely had to wait). He talked to the crowd about his running experiences, making me feel very sloth-like in the process. You see, he doesn't eat fast food. He only stares at weights in the weight room. And his high mileage weeks run somewhere in the 120-mile range. It's no wonder he's an Olympian...and one whom I can't wait to follow when the London Games happen this summer.